Frights is made from a fuzzy black material with a white belly and muzzle. He has large sparkly button eyes. The left eye is green and the right eye is orange. He has an orange nose and orange thread whiskers. The tip of his tail and the inside of his ears are also orange. Because I can hide in a witches hat! Frights was introduced on 1st July 2015. His birthday is on 19th October. This is the regular 6″ version of Frights. He was also released as a larger 9″ Beanie Boo Buddy. 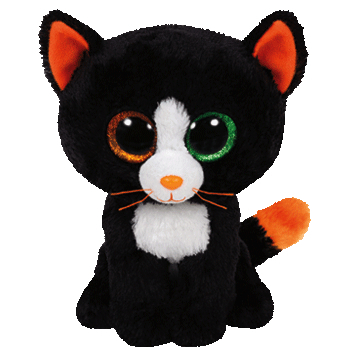 Frights is a Halloween themed Beanie Boo.